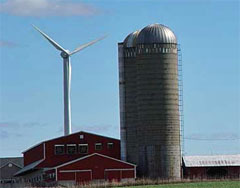 Small wind farms across Wisconsin could have an easier time gaining approval, under legislation advancing at the Capitol. The Assembly Energy and Utilities Committee on Wednesday approved legislation that allows the Public Service Commission to establish statewide siting rules for wind farm projects under 100-megawatts. Committee Chairman State Representative Jim Soletski (D-Green Bay) says the bill will help developers and communities by creating a standard that can be applied to all small wind farm proposals. The Public Service Commission currently has control over larger wind farms, but supporters of the bill says many local governments have moved to stop smaller projects by creating their own regulations that block or delay them. Under the bill, Soletski says local governments would still have the final say, but they would have to follow the PSC rules. The bill passed the committee on a 10-2 vote. State Representative Ted Zigmunt (D-Francis Creek) opposed the measure, saying it strips away local government control. The bill now heads to full Assembly.